Hei, tuhosin vanhoja Basic Greyn papereita joulukorteiksi. Kaunis lintu oksalla on Penny Blackin stanssi. Näitä kortteja tulee vielä esille myöhemmin. What great effects you have made with just some patterned paper! They are both fab but I especially like the second one, I think I like the contrast of patterns. Such a lot of wonderful Xmas card, love all of them, different colours but each one so marvelous! 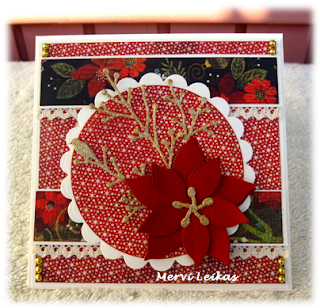 Beautiful xmas cards Mervi. You have been busy and put me to shame as I have only made about 5 so far. I must get cracking. What a gorgeous card!!! Thank you so much for sharing this with us at MIM! Remember, to be in the running to win the prize from our sponsor this week just leave a comment for another entry. Be sure to mention you saw them on Make It Monday. The more entries you comment on the more chances you have of winning! Great versions of traditional designs for Christmas! I'm definitely going to try this too, I need many more cards for Christmas and it makes sense now to make more than one using the same design/layout. One can achieve very different looks using different papers and/or colors.